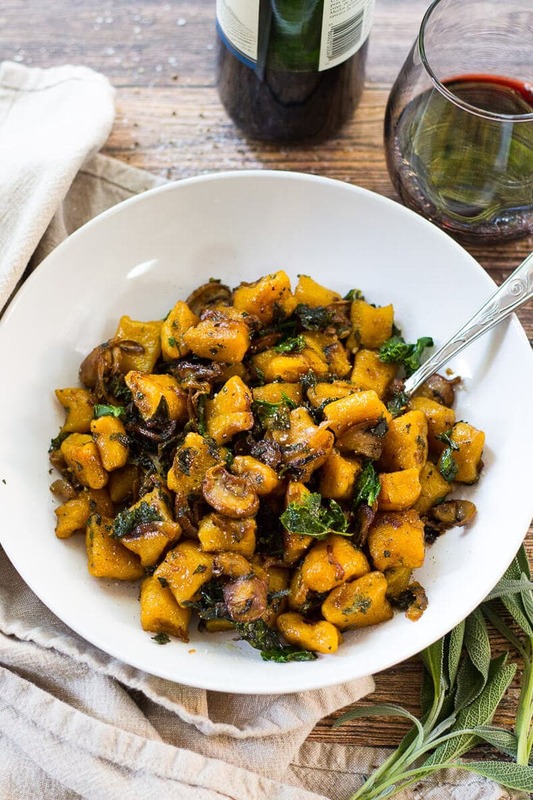 This Brown Butter Butternut Squash Gnocchi with Sage is a delicious twist on a classic, and is even tastier served with kale, mushrooms and caramelized onions. I have so many things to be grateful for this year. I finished my Master's degree this summer, grew this blog into a full-time business, re-invested in my personal fitness with some outstanding results, and ultimately re-connected with friends and family in a very special way over the past few months. Some ordinary life stages maybe, but ones I am SO appreciative of. Around a year ago, I was unhappy and heartbroken after a couple of my closest relationships started to deteriorate and ultimately ended. I felt completely alone and uncertain of my future, and like I was just working to keep my head above water. I guess you could say that I felt really hopeless. I have a great support network, from the fantastic parents who have allowed me to move home while I grow my business, to the friends who never turned their backs on me despite a period of neglect. Given my newfound happiness is due to the love and support of all the people in my life right now, this post's theme seems especially appropriate given that it's FRIENDSgiving! 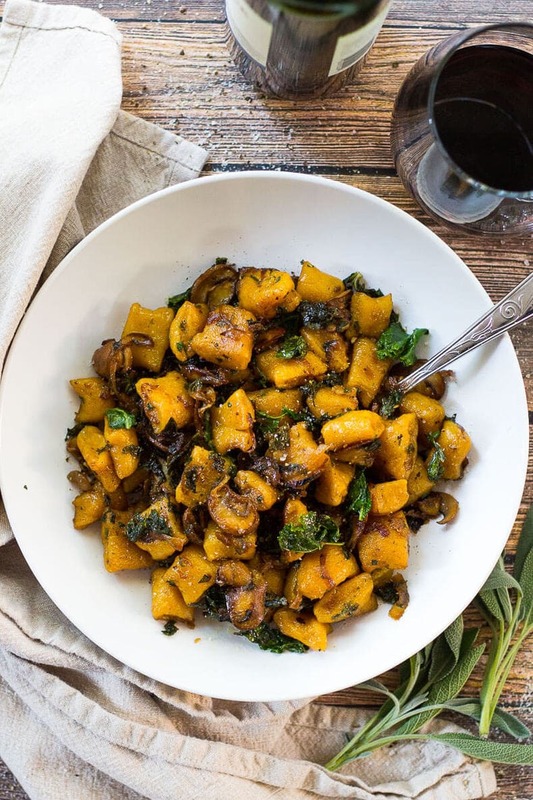 This Brown Butter Butternut Squash Gnocchi with Sage recipe is just one of many recipes featured for the Friendsgiving giveaway I'm hosting with 6 of my favourite Canadian blogger friends and Vitamix – it's a simple and luxurious dish that is sure to become a crowd favourite! If you haven't heard of it before, Friendsgiving is a great way to connect with the special people outside of your family who mean a lot to you. So many of us millennials are doing it to celebrate different relationships and eat double the tasty fall treats. Sometimes the best possible way to get closer to others is to gather as a bunch and partake in the delicious harvest of the fall season. Imagine you and your besties in the kitchen sharing a decadent bottle of red, each cooking up a storm and tasting each other's creations. I really can't think of anything better. Food is the equivalent of love, after all. To enter the giveaway, login to the Rafflecopter widget below using either your email or Facebook. Once you login, you’ll be given 15 chances to enter the contest by liking or following each bloggers’ Facebook and Instagram accounts. So what are you waiting for?! Go ahead and enter!!!!! Good luck and have a Happy Friendsgiving, no matter who you're with this year! 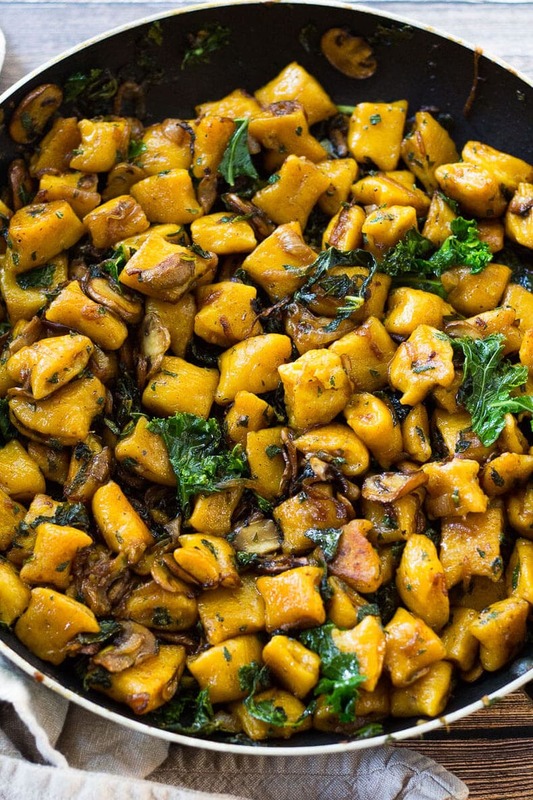 Will you be making this Brown Butter Butternut Squash Gnocchi with Sage? If you try any of my recipes, or try any of the Friendsgiving recipes, be sure to let me and my blogger friends know on Instagram, Twitter or Facebook! Slice butternut squash in half, then peel off skin. Dice into 1-inch pieces, then cook for 12-15 min with a bit of water in a large pot (just enough to cover squash). Meanwhile, slice onions, mushrooms and chop kale. Mince the garlic and sage. Set veggies aside for later. 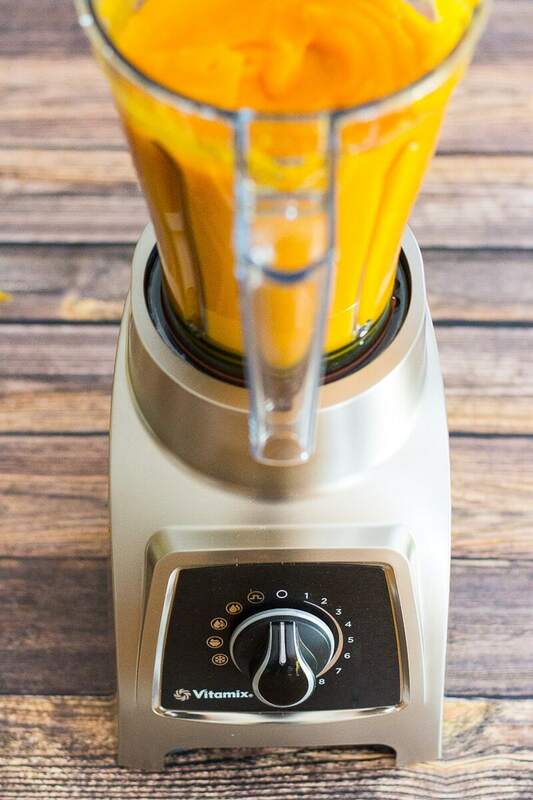 Drain water from squash, then blend in the Vitamix. Reserve 1 cup puree, and save the rest for later - it freezes well! Mix together squash puree, nutmeg, salt and pepper, parmesan cheese, egg and 1/3 of the flour. Keep adding flour in thirds, mixing together with your hands as necessary. It should feel like a soft dough. Meanwhile, heat 1 tbsp olive oil in a large skillet. Add onions, then cook on med-low heat for 10-15 min until caramelized. On a floured surface, break dough into four equal parts. Stretch and roll out each ball into 1-inch thick ropes of dough, breaking in half and continuing to roll and thin out as necessary. Meanwhile, add mushrooms and garlic to the skillet of caramelized onions and cook for 5-7 min until all juices release. Arrange all ropes of dough in a row then slice into 1-inch thick pieces of gnocchi using a pizza cutter. Cook gnocchi in a large pot of boiling salted water for 2-3 min. Gnocchi should be floating when finished cooking. Drain and set aside briefly. Add kale and butter to skillet, cooking for 3-4 min. 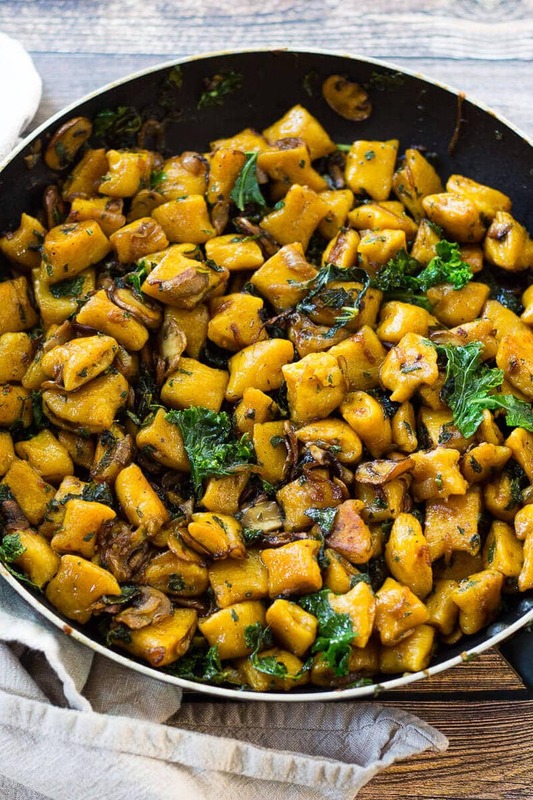 Stir in cooked gnocchi, then chopped sage. Serve with grated parmesan cheese and enjoy! Gnocchi freezes well on its own up to three months and can be made ahead of time too! What fun it’s been to join in with such talented foodies as yourself. Happy Friendsgiving, Neighbour! This looks incredible Taylor, I’ve never made gnocchi before but I do love it and this flavour combination sounds delicious. Can’t wait to try it! 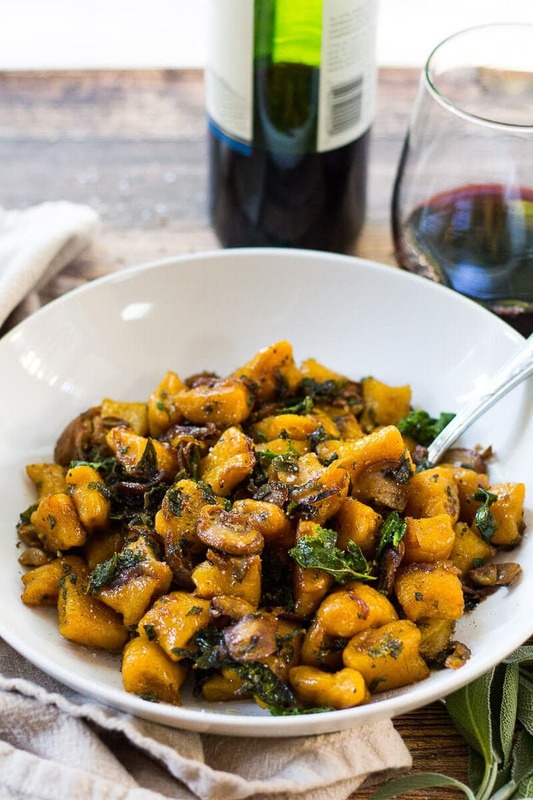 Butternut squash gnocchi, sooo good! Great job, Taylor, I’m Italian, I can recognize a good plate of gnocchi 😉 . I’m getting hungry!! Yum! Can you make the dough ahead of time and refrigerate it? Hey Maddie – yes you totally can! I would say don’t make it any more than one or two days ahead of time though! The pre-cooked dough should also freeze well! This looks AMAZING! I have a squash currently sitting on my counter, so I may give this one a try. Thanks for hosting this giveaway, my fingers are crossed. I’ve always wanted a Vitamix but the price tag scares me away. I’d love to use it to make my favourite soups in the winter and fall, and I’m sure it would help when I need to restock the freezer with homemade baby food for the little one too!